Spoilers for DC's Legends of Tomorrow. When we last left the Legends, Mick Rory warned the team that the "Pilgrim" had been sent to hunt them down. But the Pilgrim isn't coming to the present to hunt them; she's traveling to the past to eliminate them from the time streams permanently! The Legends must travel back to save their past selves and stop the Pilgrim. To the time machine! Let me start off by saying this episode was everything I didn't know I wanted. In most time-travel stories, the heroes are forbidden to cross their own time streams. Usually, they can't interfere with their past or meet their past selves because things would end up very, very bad. 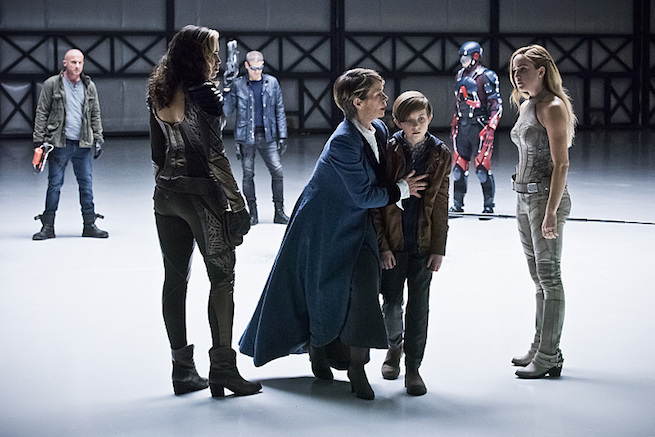 However, Legends of Tomorrow tossed that notion to the wind and decided to do something fantastic: meet the younger selves of our favorite criminals, losers, and assassins. The Legends hop through time, collecting younger versions of themselves in order to save them from the Pilgrim. Of course, it's not so simple, but that helped give the episode more plot. In addition, Mick Rory talks to his younger self on more than one occasion, which was well done on the writers' parts. (Also, casting this episode was perfect.) Younger Rory says he sounds just like his dad, which was shocking. But then Rory tells his younger self the truth, and the whole scene just really shows how far Rory has come this season. He may have betrayed his team and he may be angry, but he's grown too. He may not be a hero, but he's definitely a Legend. Mick Rory: "You can't change the things you did. But you can change who you become. Don't be like me. Be better." I was curious as to how Sara meeting Sara would affect their pasts. Do they remember any of this happen? Does it change anything or create a million alternate timelines? They don't quite explain it, which is about the only problem I had during this episode. Ray: "How long does it take for what happens in the past to affect the present? Could I be dead right now and not know it? Maybe I am dead. Hello? Can anybody hear me?" Because they can't track the Pilgrim--and nobody wants to go through what Ray went through--they decide to kidnap themselves as babies so the Pilgrim has no chance to eliminate them. And it's adorable. Baby Snart! Kendra and Sara go to pick him up, and Kendra tells Sara she's sounding like Snart. And then they both get all googly-eyed over Baby Snart, who is adorable. Also, Rory threatens his younger self not to hurt Baby Snart, and it's just beautiful. Kendra: "Okay, which one is Snart?" Sara: "Look for the one with horns." I'm continually grateful that this show has blessed the world with two strong, badass female superheroes. And that these two can be friends and can practice fighting together, talk about their crazy relationships, and also squeal over babies yet are still considered strong, smart, and beautiful. God bless Sara Lance and Kendra Saunders! Apparently, Dr. Stein was born in a car on the side of the road. Hilarious. Also, I love these pair-ups of who goes to rescue who. Rip claims they can't go rescue themselves or be involved, so the other team members have to go in and save them instead. Ray saves Rory. Sara and Rory save Sara. (So, I guess if your name is Sara Lance rules don't apply to you?) Rip saves Ray. Kendra and Sara save Snart. Rip and Rory save Stein. (Which is hilarious because Rory keeps saying the wrong things, and Rip has to correct him.) It's just wonderful how they've paired everybody up. It really gives this episode some extra fun with the conversations they have. Stein: "It's somewhat disconcerting that my father would give me up so willingly to two complete strangers." Ray: "Well, the 1950s was a much more trusting time. Trust me, I lived them." Okay, this one is probably the most touching. Stein and Ray go to pick up Baby Jax, but they find that Jax's father is at the hospital before he is shipped off to war where he'll die. (Which means Jax spent his whole life dreaming about the chance to meet his dad.) Stein, despite what Ray or Rip or anybody else says, gives Jax the chance to talk to his father. It's very sad but very happy. Mr. Jackson: "I hope you get to experience this for yourself one day. Imagining all the things my boy's gonna be when he grows up." Jax: "How do you know?" Mr. Jackson: "Because he's my son. Jefferson Jackson, remember that name. He's destined for great things." While they explained that Kendra and Rip wouldn't be targeted by the Pilgrim, we still got the chance to see Baby Rip. (Or Child Rip.) Rip takes the past selves of the Legends to The Refuge--an orphanage set in a classified time and place for future Time Masters. Thus, this is the place where Rip Hunter--or Michael--grew up. His "mother" takes care of the orphans for the Time Masters, but she's loyal to the children, not the Masters. And she's a wonderful person. I enjoyed her character immensely. She even works with them to help stop the Pilgrim, which was awesome! They set up a trap for the Pilgrim. Rip offers his life--the life of a Time Master--in exchange for the safety of his team. If Rip dies, the team wouldn't have assembled anyways. This is probably one of the finest moments on the show so far. Not only can this Pilgrim lady reverse time (aka freeze it), but she's a pretty awesome character. Her outfit, her fighting technique, her attitude--she's pretty badass and awesome. So it would take an even greater plan to stop her. Young Rip: "Thought you could snuff me out? You don't know me at all, miss." However, despite their success in stopping the Pilgrim, if they don't return their past selves to their right places in time, people will forget them. In addition, Rip informs them that they've also run out of time to stop Vandal Savage. The amnesia pills were a little convenient, and the whole talking to their past selves was a bit off-putting since I've watched too many time-travel movies/shows that say that would create some kind of paradox/alternative time lines. But besides that, this episode was just plain awesome. The casting was perfect, the Pilgrim was fantastic and definitely someone to be feared (I'm kind of sad they killed her), and saving themselves was such cool concept. I'm pumped to see what they do next. Can we time-travel to next week? What did you think of "Last Refuge"? React with me in the comments!